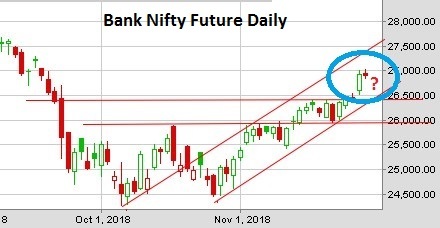 In the previous week, what I guess was a complete mistake, the Nifty and the BankNifty Future went back from Negative Breakout (10525) to the opposite of the 425 (10950) points, eventually ending at 375 (10901) points. Remember that last week was the Expiry Week. About 30 to 35 points in premiums have been added in the last 2 days. But the market did not go down. The collapse of crude oil prices in the global market and the rising Indian currency and the market helped in this regard. I think the most important thing that has fueled the rise of the market is that it is the election of 5 states. Nifty Futures 10850 and Bank Nifty Future 26550 do not continue to look at it. The next Monday market will play a very important role in this regard. 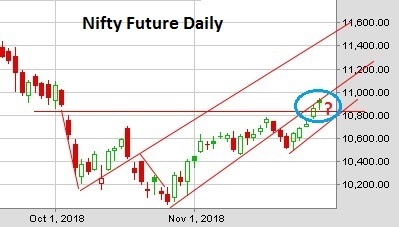 If on Monday the Nifty Future closes near or below 10850, then the last two days of Candlestick and Monday's Candlestick together will start a negative candlestick pattern. In the case of bank Nifty futures, this number is 26900 near or below it. Otherwise, Nifty Future above 10900 can go up to 200 to 300 points and Bank Nifty Futures can go up to 27550 within December 10th. Politics and elections in our country affect all sections of people. Other things are unimportant to it. The results of the state elections will be announced on December 11. So think twice before making a far-reaching decision. If the opposite result comes out on that day, then the market will go down to 180 degrees, according to the previous estimates. Until the next Lok Sabha election.